ComiCONN 2018: Avengers: Infinity War's Ross Marquand is a Moon Knight fan – and wants to play him in the MCU – AiPT! AiPT! spoke to Avengers: Infinity War actor Ross Marquand about his love of Moon Knight–a character he’d love to play in the MCU! Unless you’ve been trapped on Vormir, it’s likely you’ve seen Avengers: Infinity War and were floored by the surprise return of the Red Skull–keeper of the Soul Stone. This time around, Captain America’s archnemesis was played by The Walking Dead actor Ross Marquand, who was at Foxwoods Resort Casino June 29 and July 1 for Connecticut’s ComiCONN 2018. 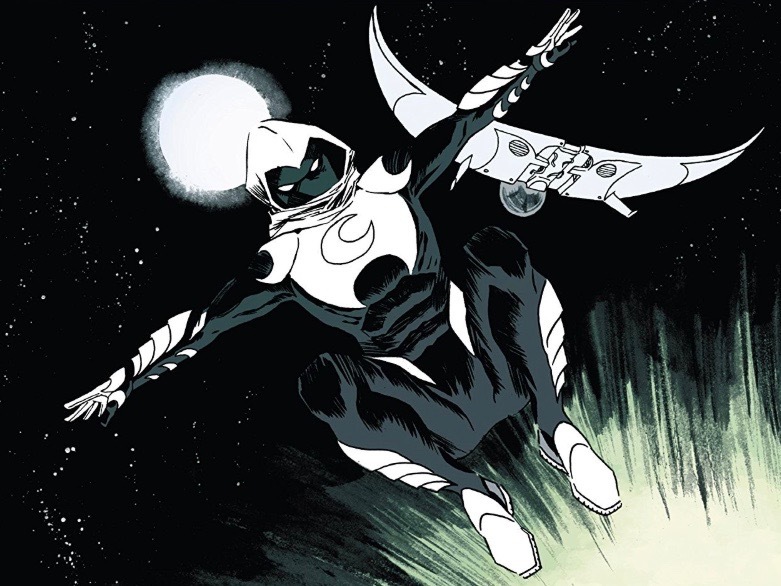 Marquand, a longtime Marvel fan, was kind enough to briefly chat with me about his early days as a Marvel Zombie and his passion for the vigilante Moon Knight, whose white suit the actor would have no problem slipping into on the big screen! AiPT! : So what comics were you into growing up? Ross Marquand: Oh, very much all things Marvel. I have Marvel Universe Series 1-3 and Marvel Masterpieces–all those beautiful Fleer trading cards. Oh my gosh. I grew up with that since I was 9, I want to say. I’d go to Mile High Comics in Denver where I’m from and I’d spend all my lawn mowing money on comic book cards, and I’d never buy the comic books so much because I couldn’t afford to do both. But I loved the collection. I loved the cataloging of all the different characters. And the comic books–you’d read them as fast as you could before the clerk told you to get out. But I just still have a genuine love of it and I’m very psyched to be part of that universe. AiPT! : You’ve played the Red Skull, but we haven’t seen your real face or heard your actual voice, so it’s possible you could still play another character in the Marvel Cinematic Universe. As a longtime fan, does a character come to mind that you’d love to play? Marquand: Oh yes–Moon Knight! It’s tough because a lot of my friends have said Moon Knight is essentially just Marvel’s answer to Batman, but I don’t agree with that. I agree that there are similarities, but Moon Knight was a mercenary–kind of a gun for hire who didn’t really have much regard for people before he had his moment of awakening, I guess. And Bruce was always a good guy–even as a kid, he was torn by revenge, but he wasn’t this bloodthirsty killer like Moon Knight was. So I think that, coupled with what they’ve been doing the last 15 years with the character–going into the dissociative identity disorder, really calling in to question if everything happening is all in his head, is he actually a vigilante killer or did he die in Egypt? It brings up a slew of questions, and that to me has never really been delved into in any comic book character before–the idea of, is any of this actually happening? Is he crazy? Is he killing good people? Is he actually dead in Egypt? Those are such amazing questions and I don’t feel like any comic book series before or since has really tapped into that. So for me, playing a crazy superhero would be awesome. So Moon Knight, Moon Knight for sure. AiPT! : Do you keep up with the current comics? Marquand: Oh yeah, right now I’m reading an anthology–going to do a deep dive into the early 2000s, and that’s kind of where they start to really branch into that stuff, and maybe by 2007 and 2008, they’re really going into the heart of the DID world and I love that stuff. AiPT! : There have been a lot of great runs in recent years–Brian Michael Bendis, Jeff Lemire, Warren Ellis. AiPT! : Thanks for taking the time to chat, Ross! It should be noted that Screen Rant asked Marvel Studios Chief Kevin Feige about the possibility of Moon Knight entering the Marvel Cinematic Universe at an Avengers: Infinity War press junket back in April, and he confirmed that Marc Spector has indeed been discussed. Whether he makes his cinematic debut five years from now or 15 is still unclear. As soon as that casting call goes out, however, Feige may not need to look far for an actor willing to sink his teeth into what’s sure to be a meaty role.